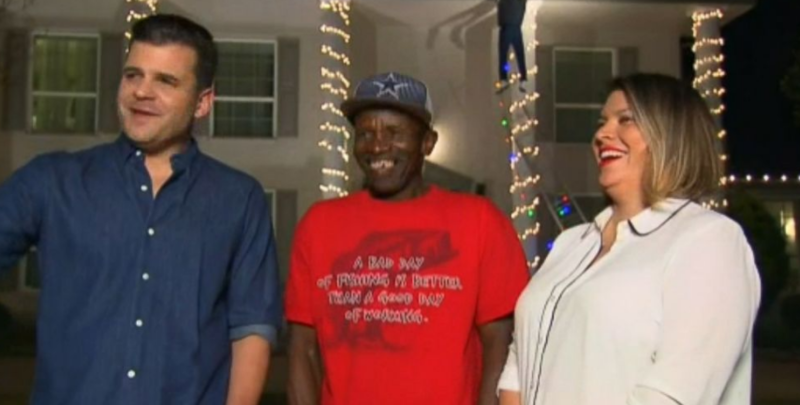 LOL: Dude In Texas Panics After Seeing A Fake Clark Griswold Hanging Off Roof In Christmas Lights Display (VIDEO) - T.V.S.T. In need of a laugh this Monday? Well, we have the perfect video for you. A family in Austin, Texas went to extremes this December for their Christmas lights display. Their neighborhood is having a contest, so they put in some work. They thought it’d be funny to have a fake Clark Griswold dangling from their roof, and it was funny to many people who drove by their house. But to one man named Alfred Norwood, Jr., it was terrifying. You see, he thought the doll was real. He ran up to the house, grabbed the ladder and attempted to save the man’s life. The best part about this story is that his attempt was caught on the family’s security cameras. He tried to get help from vehicles driving down the road, but no one stopped, so he called 911. As you can see in the video, the family found the whole thing pretty amusing. They even gave him a gift card to thank him for being such a good dude. They’ve also added a sign to their display, informing people that “Clark G.” is part of their display.